NIOS Online Admission for 2019 Session has started. 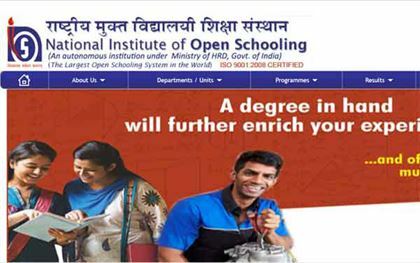 NIOS - National Institute of Open Schooling is one of the three National Boards of secondary Education and offers school education through ODL- Open and Distance Learning Mode. Learner can take admission Online under various streams or through Study Centre, Facilitation Centre, Regional Centre for the Secondary and the Senior Secondary Education Courses. Read on to know the step by step procedure for Online Admission in NIOS in 2019-20. He/She may visit his/her nearest AI (Study Centre)/Facilitation Centre and take help for on-line registration. He/She may visit the concerned Regional Centre and take help for on line registration. He/She can use the services of the Common Services Centres of the Govt. of India for Online registration throughout the Country. There is no upper age limit for admission. However, the minimum age for enrolment is 14 years for the Secondary course and 15 years for the Senior Secondary course as per information given in the entry requirements. A learner's admission is valid for five years. For Public Examination at the Secondary and the Senior Secondary level, a learner may take nine or fewer chances to successfully complete the course during the validity period of admission. Complete the information about online Admission/Examination including the fee details and its submission is displayed. Learner registers himself with NIOS website by submitting an e-mail ID and password. Access/display of Online Admission Form and filling-up of the Admission Form and attaching the image of the student’s photograph as indicated. This stream for On-line admission is open from 01.05.2019 to 30.06.2019 for all those learners who had appeared but could not clear or who were eligible but could not appear in the Public Examination of Secondary/Senior Secondary level from any recognised Examination Board and fulfil entry requirement of age, address proof as per Table 3. The learners of this stream will be eligible to appear in the October-November, 2019 Secondary/ Senior Secondary Public Examinations of NIOS on the basis of original failed marksheet/ admit card (Hall Ticket) issued by the Parent Board. This stream for On-line admission is open throughout the year for those learners who have already passed the Secondary Examination from recognised Board and want to take part admission in one subject or up to 4 subjects for updating their qualification, or learners who had appeared but could not clear, or who were eligible but could not appear in the Public Examination of the Secondary level from any recognised Board and want to appear through On Demand Examination System of NIOS for the Secondary level only and entry requirement of age, address proof as per table 3. The learners may upload the failed marksheet/Admit Card (Hall Ticket) alongwith relevant/supporting document and photograph on appropriate space available in the Online Admission Form for confirmation of the admission. Such learners who had applied for Transfer of Credit (TOC) have to send original failed marksheet mentioning the Reference Number on the back of Mark Sheet to Online Cell, NIOS, Room No. 408, A-24-25, Institutional Area, Sector-62, NOIDA-201309, Uttar Pradesh. The Subjects available for appearing through ODES at Secondary level are Hindi (201), English (202), Sanskrit (209), Mathematics (211), Science & Technology (212), Social Science (213), Economics (214), Business Studies (215), Home Science (216), Psychology (222), Indian Culture & Heritage (223), Painting (225) and Data Entry Operations (229). On-line Admission for learners who want to appear under the On Demand Examination System (ODES) of NIOS for Senior Secondary level (Stream-4): This stream for On-line admission is open throughout the year for those learners who have already passed the Senior Secondary or above from any recognized Board/University and want to take part admission in one subject or up to 4 subjects for updating their qualification; or learners who had appeared but could not clear; or who were eligible but could not appear in the Public examination of Senior Secondary level from any recognized Board and want to appear through On Demand Examination System of NIOS at the Senior Secondary level and fulfil entry requiremnt of age, address proof as per table 3. The learners may upload the failed marksheet/Admit Card (Hall Ticket) alongwith relevant/supporting document and photograph on appropriate space available in the online Admission Form for confirmation of the admission. Such learners who had applied for Transfer of Credit (TOC) have to send original failed Marksheet mentioning the Reference Number on back of Marksheet to Online Cell, NIOS, Room No. 408, A-24-25, Institutional Area, Sector-62, NOIDA-201309, Uttar Pradesh. This scheme is presently valid in the following subjects viz., Hindi (301), English (302), Sanskrit (309), Mathematics (311), Physics (312), Chemistry(313), Biology (314), History (315), Geography (316), Political Science (317), Economics (318), Business Studies (319), Accountancy (320), Home Science (321), Psychology (328), Sociology (331), Painting (332), Environmental Science (333), Mass Communication (335), Data Entry Operations (336). and Introduction to Law (338). Note : (i) Learners registering under Stream-3 and Stream-4 will be allowed to appear in the Examination only through On Demand Examination mode. They will not be allowed to appear in the Examination through the Public Examination conducted by NIOS during October/November and April/May. (ii) The learners registered under any stream will be eligible for TOC as per guidelines and conditions given in Section 2.6. (iii) A learner registering under Stream-2, Stream-3, Stream-4 and desires to take different subjects or additional subject from Parent Board, he/she will have to pay Rs. 600/- per subject in addition to Admission/Registration Fee, Exam. Fee and TOC fee. (iv) Aadhaar Card Number is compulsory for taking admission in Streams 2, 3 and 4. (A) The fee can be deposited On-line through Credit Card / Debit Card /Net Banking. (B) Through Bank Draft of any nationalised bank only in favour of Secretary, NIOS payable at respective Regional Centres of NIOS. (C) If admission is done through Common Services Centres, fee could be paid via Electronic Wallet of CSCs. if residential proof is not attached. Note: Admission once cancelled will not be re-considered.